Divine purpose and a terrific bar of chocolate, to boot. The symbols on the wrappers are traditional West African Adinkra symbols, often used on handmade crafts. Each has its own special meaning. Photo by B.A. Van Sise. PETER ROT is the chocolate reporter for THE NIBBLE. CAPSULE REPORT: The Kuapa Kokoo farmers’ co-op in Ghana deserves attention not only for its admirable social mission, but for its excellent chocolate. And you can’t beat the price: ten 3.5-ounce bars for $18.00! Support these farmers and their excellent chocolate, use it to teach your family about the plight of farmers and why we should support Fair Trade, and feel good about every bite. Theobroma cacao, the pod-bearing “chocolate tree,” originated in the Amazon basin of South America perhaps 10,000 years ago; it was cultivated by the Olmecs in the area that today is Guatemala as early as 1,500 B.C. It took until the mid-19th century for a blacksmith named Tette Quarshie to bring cacao to Ghana from Equatorial Guinea, but in the period from 1911 to 1976, Ghana became the world’s leading producer of cacao beans, contributing between 30% to 40% of the world’s total market. Much of that is bulk chocolate—nameless products to mass-marketed newsstand chocolate like Hershey Bars. But some of the beans grown in Ghana rank among the world’s best. 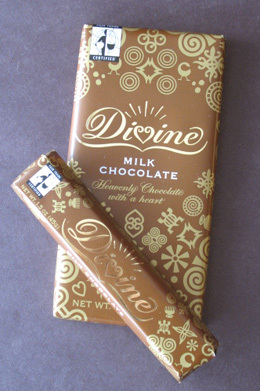 If you’ve ever wanted to try chocolate whose name speaks for itself, try Divine Chocolate. It would be easy for this name to belong to some mundane chocolate that was anything but Divine (products from companies called Exceptional and Amazing rarely are). But here, the name rings true. 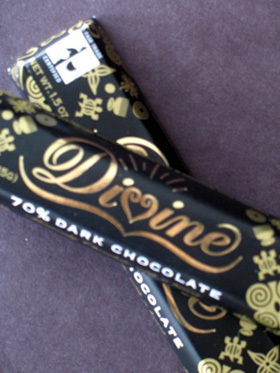 Once known as The Day Chocolate Company, a name change occurred in January to honor the company’s flagship product, the Darkly Divine 70% Bar, which is now simply called 70%. 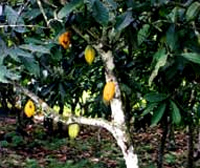 Photo: A Forastero cacao tree. * Most of cacao’s processing occurs outside of the country in which it was grown. But perhaps the most important processing is conducted inside the country, by the farmers themselves. Aside from the actual harvesting and cracking open of the pods, the seeds must be dried and fermented properly in order to be processed further in foreign countries. Fermentation is one of the most important factors in flavor development, while roasting (which occurs outside) serves as the other. In 1993, in order to gain more power in an industry where their voice was not being heard, a group of Ghanaian cacao farmers set up their own cooperative, with a goal to produce the finest cacao beans and work for a better future for the members and their families (Ghana has a notorious history of child slavery and unfair wages paid to the farmers). The farmers sold their own cacao to the Cocoa Marketing Company (CMC), the state-owned company that exports Ghanaian cacao. Thus, the Kuapa Kokoo Farmers’ Cooperative was born, a company that not only grows its own cacao but also manages the selling process, without the aid of government agents. In 1997, the farmers voted to set up their own Fair Trade chocolate company in the U.K. With an investment from The Body Shop and Twin Trading and support from Christian Aid and Comic Relief, Divine Chocolate was launched as the world’s first (and still the only) farmer-owned and Fair Trade Certified chocolate company. The cooperative sold its first bar of milk chocolate in 1998. In 2006, Divine set up a U.S. marketing company; as in the U.K., Kuapa Kokoo owns a significant share of the company and holds two seats on the board. Africa is the top cacao-producing area of the world. There are	approximately 11 million cacao farmers in West Africa. It	takes the entire year’s output of cacao beans of one tree to make	just	three	3.5-ounce bars of chocolate. The success of Divine Chocolate means that the farmers have a secure source of Fair Trade income and can therefore decide how their money is invested into the communities. They can, for example, install more drinking water wells, build schools, enjoy healthcare and improve farms, all of which helps to build the brighter future the founding fathers (and mothers) envisioned 15 years ago. Fair Trade income assures a guaranteed minimum price for for the crops and provides a premium back to the farmers that can be invested in their farms and communities. Divine Chocolate takes Fair Trade one step further through its pioneering farmer-ownership model: As part-owners of Divine, Kuapa Kokoo enjoys not only a share of the profits, but a say in the direction of the company and a seat at the table of global trade. Kuapa Kokoo is responsible for 1% of the world’s cacao exports. Kuapa Kokoo translates to “good cocoa growers,” but we interpret it as “selfless, honest, right-minded, responsible, venerable cocoa growers.” While the ultimate mission behind this company is straightforward—empowering farmers—the actions in order to accomplish this goal are not. Through their efforts, Kuapa Kokoo wishes to earn a dignified livelihood, increase women’s participation in all activities, and to develop environmentally friendly cultivation practices for cacao. Yet the company retains a modest name. They are good cocoa growers making very good chocolate. The cacao used in the Divine chocolate bars is Forastero, the bean grown in Africa. While Forastero represents 90% of the world bean crop (Criollo and Trinitario divide the rest), it is known more for its hardiness than for its finesse. 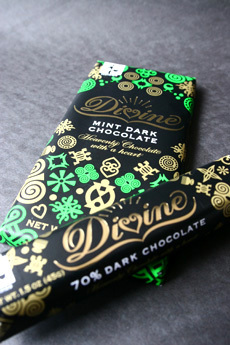 Divine makes bars in two sizes, a 3.5 ounces and 1.5 ounces, in Dark 70%, Dark 70% with Mint, Milk Chocolate, Coffee Milk Chocolate, Hazelnut Milk Chocolate, Orange Milk Chocolate and White Chocolate. We were only able to try half of the flavors, but rest assured, we will making our way to the nearest store to purchase the rest! Dark 70%. Ghana cacao is generally known for its noncomplex flavor and somewhat hearty character—but Divine differs in their approach. The flavor is unusually mild and offers a complexity that is not found too often in this origin. In fact, the profile is uncannily similar to gianduja (hazelnut praliné), of all things, but expands with blueberries, bananas, coconuts, and a closing touch of sweet spice for a final teaser. If only Divine could retain the chocolaty impact that Theo Chocolates coaxes out of its Ghana beans, this could be a runner-up for the world’s best Ghana chocolate. Milk 27%. At a mere 27% cacao, this chocolate still manages to muster a chocolatiness that is more than satisfying, despite the apparently low cocoa solids. The point here, however, is that the sweetness is not as cloying as one might be led to believe from the label. In fact, unlike most milk chocolates, this one has a character inseparable and unique to this manufacturer, one that makes it stand out among the competition. We might go so far as to say that we would actually seek this bar out, just to take a break from our regular dark chocolate diet. Dark 70% with Mint. This bar is made with the same delicious 70% cacao chocolate but has crunchy pieces of peppermint scattered throughout. The overall effect is analogous to eating a gourmet Girl Scouts Thin Mint cookie; but here, you have health benefits that cookies lack! The Coffee Milk Chocolate and Orange Milk Chocolate are not yet imported into the U.S., nor is the cocoa powder. Let’s hope they get here soon. The company is currently working on kosher certification. Organic chocolate is not currently on the boards: The cacao tree is very prone to diseases, which can quickly spread, wipe out large areas of cultivation and endanger the livelihoods of thousands of farmers. Until enough tests have been done on organically approved pesticides in the Ghanaian environment, introducing organic cacao farming is considered too high a risk to the economy of Ghana, which relies heavily on its cacao crop. into a chilled martini glass. 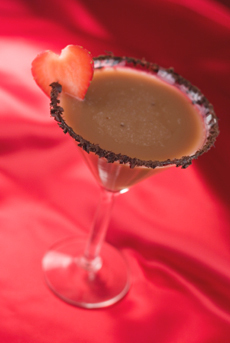 A “Divine” variation on the Chocolate Martini. wafer crumbs. Photo by Kelly Cline. 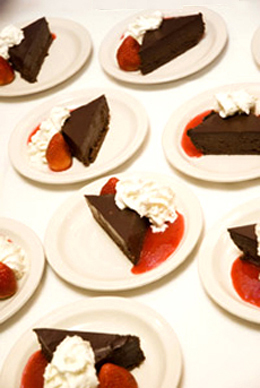 Enjoy dark and milk Divine simultaneously in this Double Chocolate Torte. Preheat oven to 350ºF. Line terrine molds with parchment paper and set aside. Combine butter, chocolate, sugar, water and bourbon in a bowl and melt together over simmering water. When completely melted, cool slightly and whisk in eggs and vanilla. Scrape into prepared molds and bake until cakes are set, about 50 minutes to 1 hour. Cool, then refrigerate overnight (must be completely chilled before un-molding and glazing). Place chopped chocolate in a dry bowl. Combine cream and corn syrup in a saucepan and bring to a boil. Pour over chocolate and let sit 3-5 minutes, then stir gently until chocolate is completely melted and mixture is smooth. Add bourbon. Set aside at room temperature for 15 minutes to firm up slightly before glazing the cakes. Recipe courtesy of Marion Pitcher, Pastry Chef for the Clydes Group, Washington, D.C. Whether you like your chocolate in bars, at a bar (like the chocolate martini) or cooked, you can have your torte and eat it Divinely in the name of Fair Trade. One-month supply of dark chocolate. See additional recipes at DivineChocolate.com (you’ll need to convert British measurements to American).